There is no doubt that cannabidiol (CBD) oil is used to help manage many diseases and medical conditions. Sufferers of cancer, diabetes, arthritis and the majority of old age-related ailments have reported feeling better after using hemp oil products. On the other hand, those receiving harsh conventional treatments such as chemotherapy have found in it a remedy that controls the sides effects without causing others. However, those mentioned above belong to just one category of those who recognize CBD oil benefits. Indeed, there is another that comprises individuals who are not suffering from any form of ailment but are looking for CBD’s healthy benefits. The following are seven CBD oil benefits this latter group of users has found. Sometimes, you just feel tired. You lack the energy to do even the simplest of tasks. This feeling could occur even in the morning right after getting out of bed and not having engaged in any physically involving tasks. It’s usually a good idea to visit the doctor when faced with this condition, especially if it becomes something you have to deal with on a daily basis. It could be a sign of depression or even a developing heart problem or advanced form of anaemia. However, it could also be a sign of your body simply being low on energy. 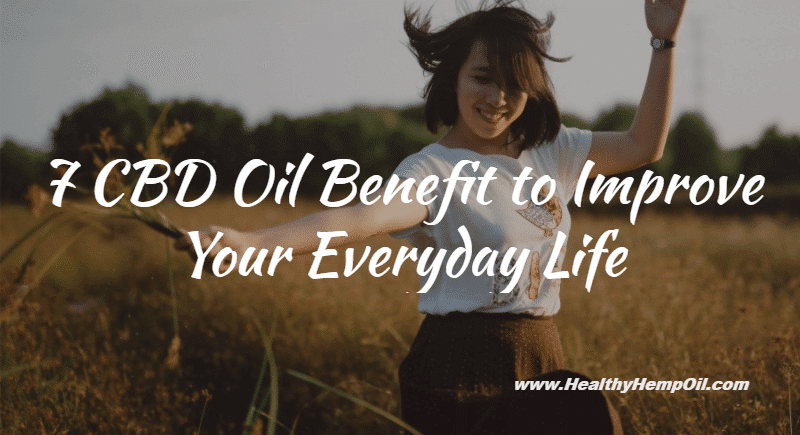 In this case, CBD oil can help boost your energy levels and, therefore, promote the wakefulness of your body throughout the day. It achieves this by strengthening individual body cells and ensuring that they are in good working condition at all times. Anxiety is an emotional feeling that you may experience sometimes, especially when you are worried about things that matter to you most. However, if it occurs for longer periods or is caused by things that ordinarily should not cause anxiety, and if it goes unchecked for a long time, your life might become unbearable. One of the known CBD oil benefits is calming the nerves and, therefore, helping to lower any feelings of paranoia and anxiety. CBD administered on its own can reduce anxiety, intense stress and panic, all without causing any psychoactive effects. Furthermore, CBD oil may be the best alternative because, unlike pharmaceutical drugs treating this condition, it does not become additive or harm your organs such as the liver and kidneys even when used for an extended period of time. CBD oil has antioxidant properties exceeding vitamin C or E in intensity. When your body tissues use oxygen to burn food as fuel, the reaction produces unstable particles known as free radicals, which have negative effects on your tissues. CBD oil gives the body the ability to protect itself against inflammation and stress that these free radicals induce. While the feeling of nausea and vomiting could be a sign of an ailment or pregnancy, there are many individuals in whom these are caused by such things as weather, certain smells, or even being in a moving vehicle. CBD oil has anti-nausea properties that help in the suppression of nausea and vomiting in animals and human beings. If you often face the feeling that you need to vomit and it is not because you are sick or expectant, then this could be your most appropriate remedy. Weight management comes down to two components: food intake and physical exercise. One of the proven CBD oil benefits is suppressing the craving for food. It is also an excellent metabolism stabilizer, which is critical when it comes to physical exercise. Additionally, people who experience difficulties in eating due to anxiety or stress can use CBD oil to get rid of these feelings and, therefore, be in a better condition to eat appropriately. Alcohol, especially when taken in large quantities, exposes organs like the liver and kidneys to likely extensive damage. CBD oil has properties suggested to protect these organs from damage induced by excess alcohol consumption. It does this by preventing the accumulation of fats and lipids in the liver that lead to serious problems like cirrhosis. CBD oil benefits are indeed numerous, and, as you can see from above, it is not only the sick who can benefit from buying CBD oil products. Healthy individuals can boost and maintain their well being by taking them as a form of supplement. However, even in this case, it is important to consult your doctor and also consider the cannabidiol legal status in your state. What is the main obstacle in your state to healthy people using CBD oil products? We like to hear from you. Leave us a comment below!